Sage CRM 2019 R1 passed the QA process on Friday 1st February 2019 and was released to the Sage OpCos today. It is the first release within the new 3-year roadmap for the product that sets the development path through until 2021 and beyond. It demonstrates Sage’s continued commitment to the integrated Sales, Marketing and Service modules for Sage Business Cloud systems within the Sage 200 franchise or family of accounting products. The exact release date in your country will be determined by your local Sage team as the QA processes for the various integrations will need to be confirmed. 11 new enhancements to existing features designed to improve customer experience and product usability. 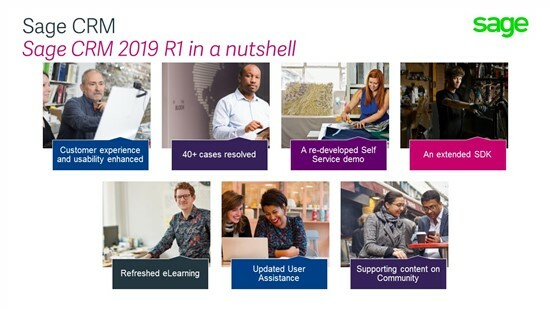 Over the next few weeks, we will be sharing articles and additional resources that will make sure that colleagues, partners and customers can get the best out of the system. Is the CRM roadmap available online to partners? Yes! But not on the Community. You should be able to get this through you local Sage OpCo. It will either be on the partner portal or available from the support and product management teams. It is best getting it from the local team because they will be able to put it into context of the RoadMap for the local accounting product integration.